Happy Monday!! Hallelujah this is a short week. 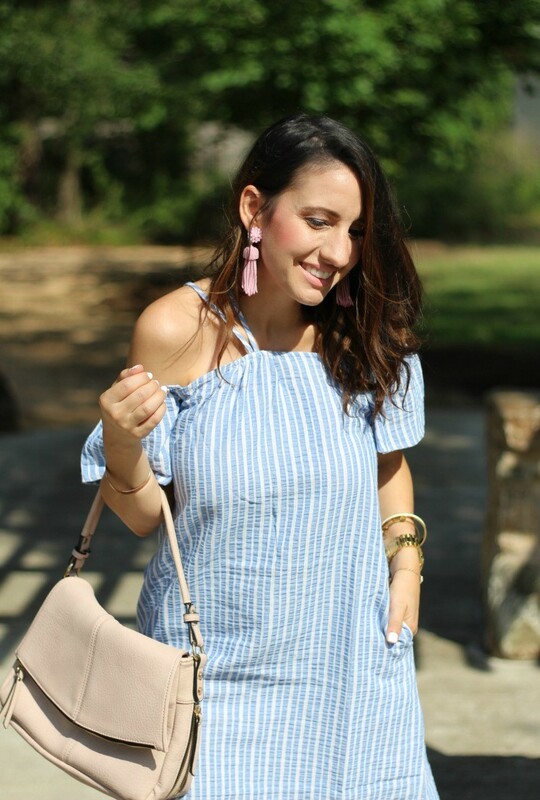 I have the perfect dress to celebrate Memorial Day in, and basically all summer in. 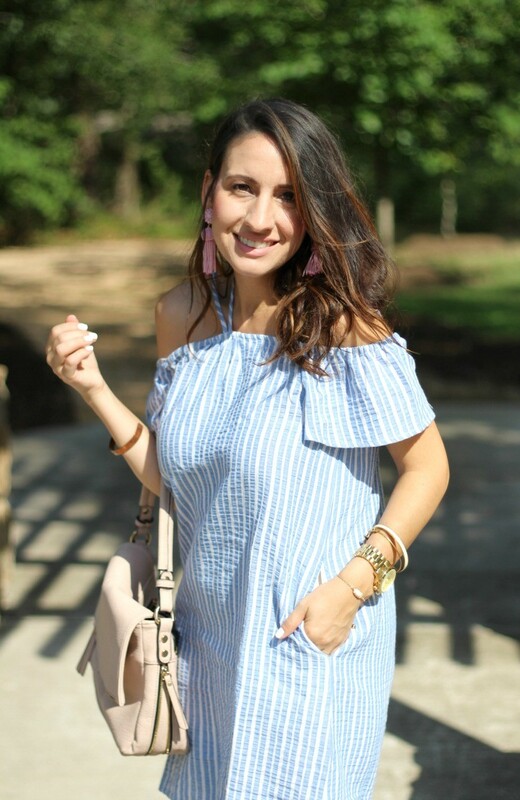 It’s a super cute blue and white off the shoulder number that has me ready for all kinds of fun summer get togethers. Ya’ll know I love a cute anything in blue and white. I think what I love most about this dress is the neckline, that it has pockets, and that it’s under $50. It comes in this cute blue and white color combo, and a darker denim color with white stripes as well. Ya’ll I am so impressed with the quality of the fabric, and the price point. I know I’ve done good when my husband loves it too. 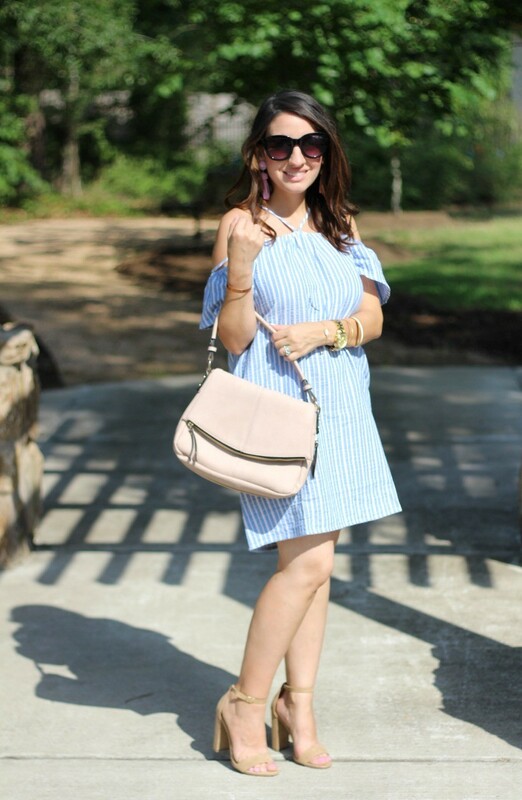 This is really versatile dress that can be dressed up, or down with a wedge or sandal. 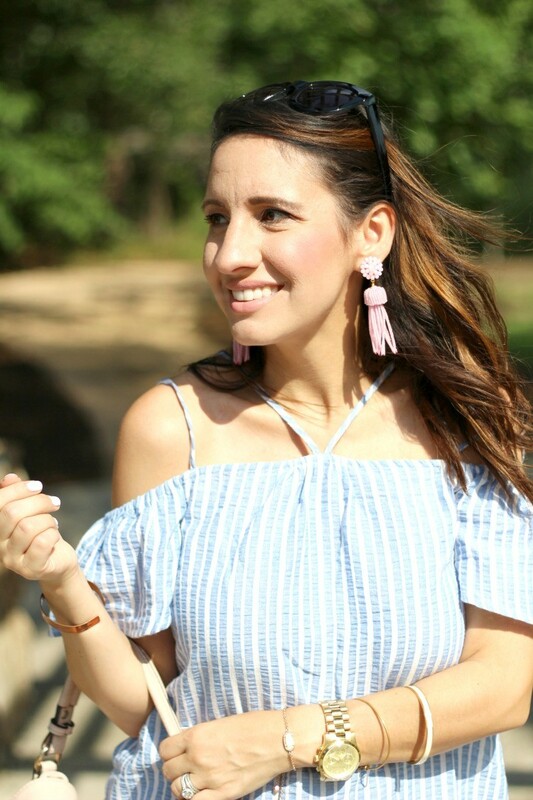 If you want to style it for Memorial Day, or Fourth of July just add some cute red tassel earrings, and you’re all set. The neckline and cute sleeves make a statement on their own. It’s still available in all sizes, but I have a feeling it’s going to sell out pretty quickly. Do ya’ll have any big plans for the holiday weekend? We were thinking of going on a mini trip, but our two dogs have vet appointments. So staycation it is. I think I’m going to take the kiddos to the zoo if the weather is good. I keep hearing we might have a lot of rain. I’m crossing my fingers the weather cooperates. Thanks girl!! I feel the same way!! Thanks for the love on this cute dress. I still can’t get over it being under $50!! Happy Monday!! What a fabulous find, you go girl! Nothing like a good sale. You look beautiful! I absolutely love this dress! Mama! This dress is absolutely GORG!! Such a cute dress & love those sandals! 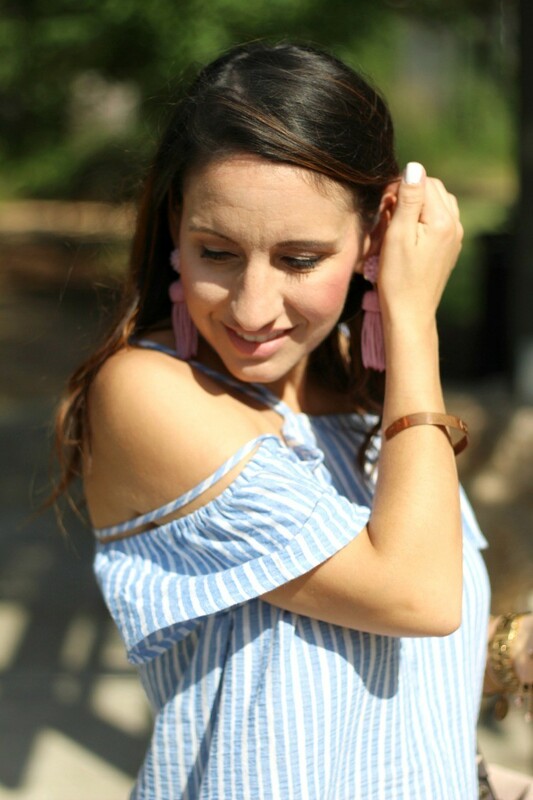 This dress is so cute and I love it paired with your earrings too! 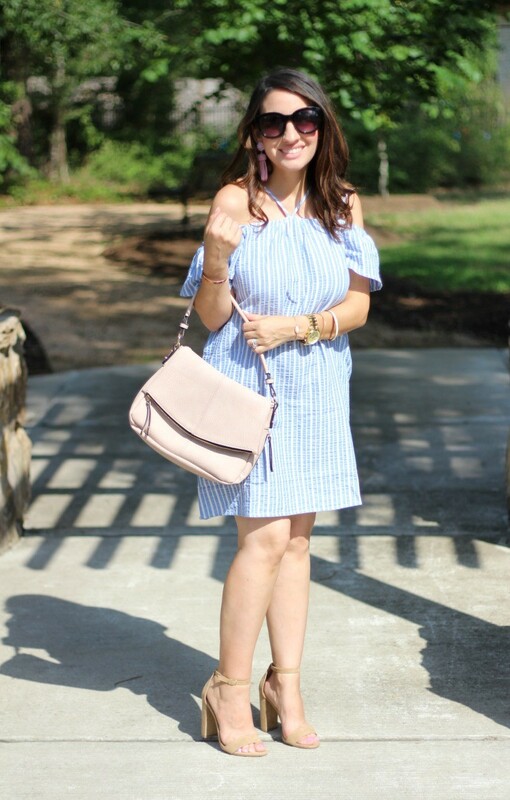 What a fun summer dress! 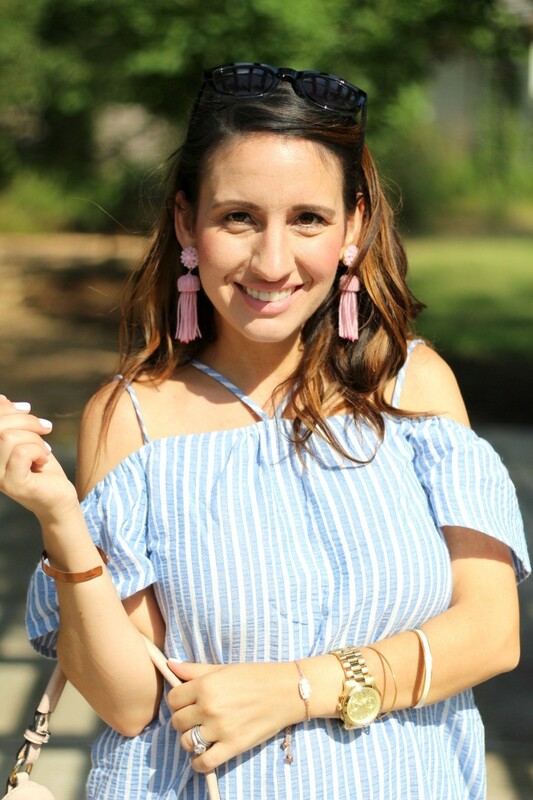 I love that you added the little pop of pink with your fun tassel earrings. Loving that dress! The shoulders are so fun. We are going camping for Memorial Day. Honestly, a staycation sounds better! 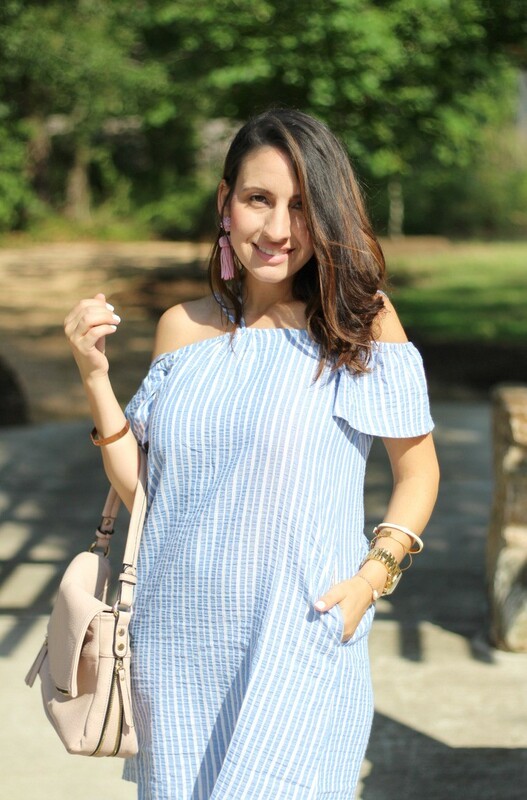 Love the dress, its totally is perfect for the warm weather and I love the creative way you wear the halter string! Such a cute dress! 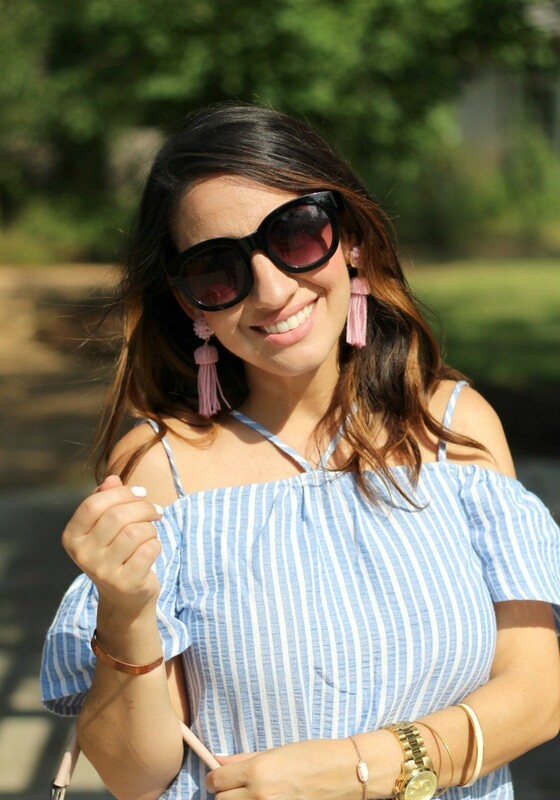 I love the pink earrings paired with it! Such a cute dress! 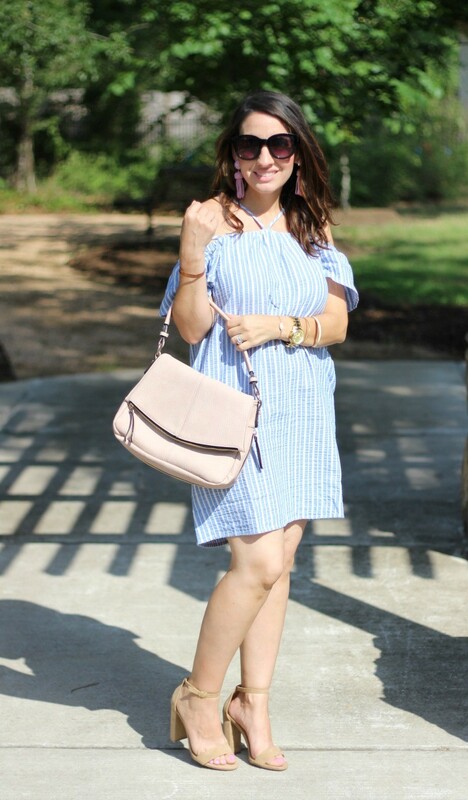 I love the stripes for summer!!! Modest girl here has been venturing out to show off her shoulders. This dress will be one of my new favorites. Love the subtle pops of pink and I adore anything Lisi Lerch! Love the dress as well as your earrings!